The meta description should be shorter than 1000 pixels. It is currently 1409 pixels long. 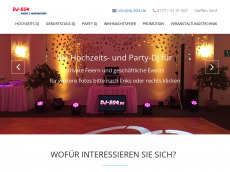 Test up to 1.000 webpages of dj-804.de with our free plan! This page contains 2331 words. That's ok.
43.3% of the text are stop words. 45 paragraphs were found on this page. The average number of words per sentence of 11.28 words is good. The usage of strong and bold tags is perfect. We recommend the use of up to 47 tags for this page. There are 61 headings on the page. The amount of headings should be in a more proper relation to the amount of text. This website redirects to "https://www.dj-804.de/"
This website only has backlinks from 13 referring domains. This website only has 60 backlinks. This website only has few backlinks from 13 different ip addresses.